Most Bengalis are aware that Rabindranath Tagore penned the national anthem of two countries. I wonder how many know of the teenage girl whose voice, broadcast over radio, inspired soldiers of two countries in the battlefields of two different wars in two different corners of the subcontinent. Shahnaz Begum did just that, before she became Shahnaz Rahmatullah. I am not surprised that the older of the two songs is forgotten — who really cares about the 1965 war in Bangladesh. I am, however, shocked that this is not widely shared. As long as those two countries born of blood and tear survive, Shahnaz Begum’s voice will live. Demagogues. Charlatans. Con men. Time servers. Cronies. Populist politicians. Abusive husbands. It’s not a world fighting for. Love stories tend to be boring because they tend to end in rather predictable ways. And yet, from Radha-Krishna and Laila-Majnu to Romeo-Juliet and, because we aren’t unaffected by Bollywood, Amitabh-Rekha, our imaginations are captured by love stories. Yes, that last sentence is a derivative of something from Midnight’s Children. Salman Rushdie, of course, drew inspiration from the famous Bollywood romance for his infamous Satanic Verses filmstar-gone-crazy who was haunted by his jilted lover Rekha Merchant. Then there is the Shashi Tharoor novel about the rise and fall and apotheosis of the matinee idol Amitabhshok Bachchanjara, with a many pages on his off screen romance. It’s fitting then that the last movie to star Bollywood’s most famous couple is a tale of socially ostracised love, which also happens to have one of the best love songs to come out of Bombay. The Bachchan monologue — I often wonder with my solitude what if you were here — tells us that it’s a sad song. But it’s the multiple possibilities and nuances of the female perspective — rendered sublimely by Lata Mungeshkar — that makes the song what it is. Theirs was the stuff of fairy tale romance. The son of a Supreme Court judge and a charismatic English professor, he was brought up to be a pukka gentleman. She came from the wrong side of the poorest of backwater towns, first in the family to make it to university, relying on nothing but her grit. They were white collar professionals, colleagues who fell in love in their late 20s. I was there—it happened in my living room actually. They moved in, and then moved overseas together for greater opportunities, for both. Careers progressed, and love deepened. About ten years ago, they got married in a picturesque island. Couple of years later they returned to a large wooden house with a big backyard to raise a little girl, and then a boy. Financially secure — they benefitted from the asset booms of that decade — it was a time for career change, to follow their hearts. She joined politics. He decided to pursue his passion for writing. Then the fairy tale ended. While turning 40, she finds that politics is hard work, and merely willing isn’t enough. He is in deep blue funk, with writing going nowhere. Kids are alright, I guess. But the parents most definitely aren’t. How about a more conventional couple? Both from straight forward middle class families. Met in their 20s through friends, and started seeing each other frequently, and then exclusively. He had an opportunity to move overseas for work. Marriage was the only way for them to be together, even though this meant an end to her career. A decade and three daughters later, she is mostly tired and bitter. Meanwhile, he wonders what might have been had they never met. These are not isolated incidences. Whether in Desh or in the west, I see couples of my age and socioeconomic background, regardless of ethnicity or culture, in stale, unexciting marriages where no one is really at fault, where the fire of passion is buried in repressed memories and forced indifference. And these are the marriages that survive. Scarily, I joked recently with a friend that I am more likely now to attend a social shindig marking the end of someone’s marriage than a wedding! What happens? In short, life. It’s hard to navigate the demands of modern life — finances needed for the standard of living we aspire to, but also the expectations of personal achievements we set ourselves, and then there is the social rat race that none of us are really immune from. All that before we throw in the curve ball of raising kids and the emotional and physical tolls that entail. I was 14 when a Dhanmondi girl first told me about Valentine’s Day — no, not asking me for a date, rather informing me about hers. In the quarter century since, in and out of relationships, the day has never really resonated with me. Call me unromantic? Not so fast. You see, I do love rom coms, particularly on the small screen. And could there be a better show to showcase my case? 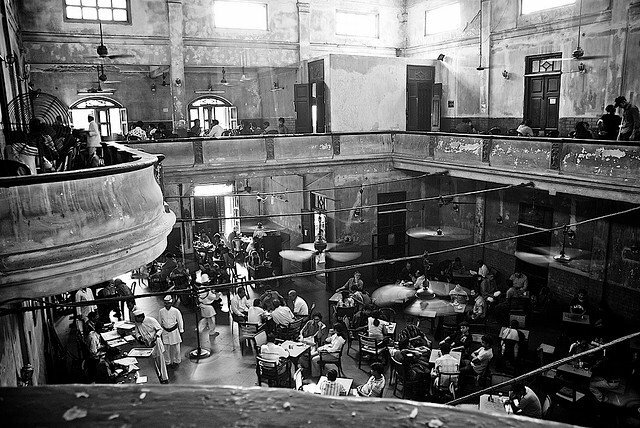 As every educated Bengali knows, decades before a bunch of photogenic New Yorkers made it trendy, hanging out in a cafe — the Coffee House was cool. Hanging out — adda –with your friends after work, who can’t relate to that? The Manna Dey classic suggests the great experience mid-20th century Calcutta would have been for young guys — the Art College graduate drawing sketches for marketing firms before making it to Paris, the reporter who would migrate to Dhaka (and write a great book on 1971), the Goanese guitarist who died young, the amatuer actor suffering from a romantic tragedy related breakdown, the unrecognised poet with cancer…. Ah, yes, the girl…. the one who is supposed to be happy because she has a millionaire husband who buys her jewellery…. Ray’s Big City wasn’t a great place for women. Much of the subcontinent still isn’t. মুঘল ইতিহাসবিদ আবুল ফজল লিখেছিলেন বাংলাদেশের জলবায়ু নাকি মৌলিক প্রবৃত্তিকে উস্কে দেয়, ফলে এদেশে সর্বদা বিদ্রোহের ধুলি ওরে। আমার কাছে দেশের ভ্যাপসা গরমে কখনো বিপ্লব করতে ইচ্ছে হয়নি, তবে আমাদের মনে হয় ছোটবেলা থেকেই একটা বিপ্লবী anti-establishment romanticism দিয়ে মগজ ধোলাই এর চেষ্টা চলে। বিশ্বাস হচ্ছে না? আমাদের যাদের ৭০ এর দশকে জন্ম, আমরা একটু চোখ বন্ধ করলেই মনে করতে পারব বিটিভির সাদাকালো পর্দায় খালামনি আর ছোট্ট সোনামনিরা গাইছে ক-এ কলা ক-এ খাই। মনে পরছে? পরের লাইনটা মনে আছে? এত বেশি খেতে নাই, গ-এ গরু ঘ-এ ঘাস, কত ঘাস খেতে চাস? তারপর? গণপ্রজাতন্ত্র আর জাতীয়াতাবাদ — প-এ পাপ, ফ-এ ফল, রাজা গেল রসাতল…. ম-এ মাটি ম-এ মা, মাটি আমার মা…. আসে পুঁজিবাদের মুনাফার সংকট — ল-এ লাল ব-এ বাতি, জলছে যে লাল বাতি, তালব্য শ বলে বেশি বেশি কেন নিলে? ফলাফল — খন্ড-ৎ-এ কুপোকাৎ,হঠ করে বাজিমাৎ ! It’s the 50th anniversary of JFK assassination. When he first became the president, JFK was viewed by many in a similar way as how people viewed George W Bush —a not-too-bright son of a political dynasty who got the top job through money and dirty deals. Then, just like Bush, Kennedy’s stock rose because of an international crisis — the Cuban missile crisis was JFK’s 9/11 moment. He was hailed as a great leader. And then he was killed, and became a martyr. His successor, LBJ, was far less charismatic. While JFK was the suave Boston Brahmin, LBJ was an uncouth Texan. Still, LBJ won a landslide — largely on JFK sympathy — and pushed through a lot of progressive legislation, including giving Black Americans the right to vote. But then the Vietnam War escalated, US was gripped by race riots and cultural changes, and LBJ’s presidency ended in failure —he didn’t seek re-election in 1968.